How often do you use the defroster on your car in the summertime? Well, for the past two mornings — both of which have been sunny here in Houston (where I’m working this week) — I’ve turned on the front and rear defrosters in my rental car since I couldn’t see out of the front or rear windshields. Both mornings, I found it concerning when my front windshield didn’t clear after a few minutes. The only thing I could do to navigate on the highway was to keep the windshield wipers on, at a speed I’d typically use for a moderate rainfall, the entire drive. Every time the wipers squeaked across the windshield — from trying to eradicate wetness that was no longer there — I’d turn the wipers to intermittent. Seconds later, the front windshield would fog again and I’d have to speed up the wipers. Was something wrong with my rental car? There was a resounding “Houston Thing!” response from the coaches. Apparently, it’s so hot and humid in the mornings that one needs to turn on the defrosters to clear the windshields. Like me, they told me it’s easy to clear their rear ones, but not the front windshields. That’s when two of them shared a tip with me: crank up the heat in the car (even though it’s already hot outside), open your windows so you don’t faint from the heat, and turn on the front defroster. Apparently, that’s the only thing that will work. Pennsylvania has its fair share of high heat, elevated dew points, and humidity in the summertime, but nothing like this has ever happened to me before! For some reason, something different happens to cars in the Houston summers. Guess what I’ll be doing when I find my front windshield fogged up tomorrow morning? Today was not a relaxing snow day simply for the fact that I spent much of it out of my home. I had a medical procedure scheduled for 10:00 a.m. I was determined to get there due to the flare-up in pain I’ve had in my neck/shoulder/wrist for the past three weeks. While I made it there a few minutes early, I spent much of my day white-knuckling my steering wheel as I drove to and from the appointment s-l-o-w-l-y on unplowed roads. The highlight of my day came after Ari woke up from his nap. Marc and Isabelle were outside building a snowman. I poked my head out the door and asked if they were interested in company. (They were!) Despite my desire to lay on the couch with ice packs, I bundled Ari and myself up and headed outside. Once we were outside, I realized this was Ari’s first time “playing” in the snow. Initially, he didn’t know how to move or what to do. As the minutes passed, Ari got comfortable playing, walking, and getting gentle sled rides down the driveway. In fact, he didn’t want to go inside for dinner. I smiled as I removed Ari’s snowsuit, booties, mittens, and hat. Despite being achy, I was thrilled I steeled myself so that I could watch my kids play in the snow — together! — for the first time. It made what was otherwise an exhausting day brighter. Yesterday I was busy: driving on back-country roads and working with teachers. Today I am moving slowly: staying at home and playing with Ari. Yesterday I ate in a hurry: turkey sandwich, yellow peppers, Sumo orange, and trail mix. Today I had a leisurely meal: breakfast tacos made with spinach, eggs, queso fresco, and hot sauce. Yesterday I debriefed classroom visits and talked about minilessons. Today I’m reading board books again and again and again. Last night, we did our grocery shopping as a family because Wegmans is like a night out, right?!!? 😉 Oh how different our lives are from ten years ago when my husband and I started dating while living in New York City! My husband is working this weekend, which means he cannot take Isabelle out for breakfast and to the grocery store on Sunday like he usually does. Our community’s Purim Carnival was scheduled for today. With all the snow we’ve had this winter, I’ve ceased telling Isabelle what we’re doing the next day if snow is in the forecast since our plans have changed one time too many this winter. She didn’t know we were planning to go to the Purim Carnival. I’m thankful I didn’t tell her because I woke up to SNOW. Again. I provided Isabelle with stickers and card stock to amuse her while I handed Slicer stuff in my office. The Purim Carnival went on without us. (I’m not sure how big it was, but a friend posted a photo of her and her daughter there on Facebook.) Instead, we stayed home in our pajamas while my husband went to work. We had a leisurely breakfast and snuggled in front of the fireplace. I even let her watch a couple of episodes of “Daniel Tiger’s Neighborhood.” However, I wasn’t as available as I typically am when I’m home with Isabelle because today is the first day of the Slice of Life Story Challenge. I spent a lot of time moderating comments, answering questions, and sending e-mails regarding some issues a few people were having. And while I didn’t mind the extra computer time, Isabelle did. After hanging out in my office with me for a bit, she decided enough was enough. 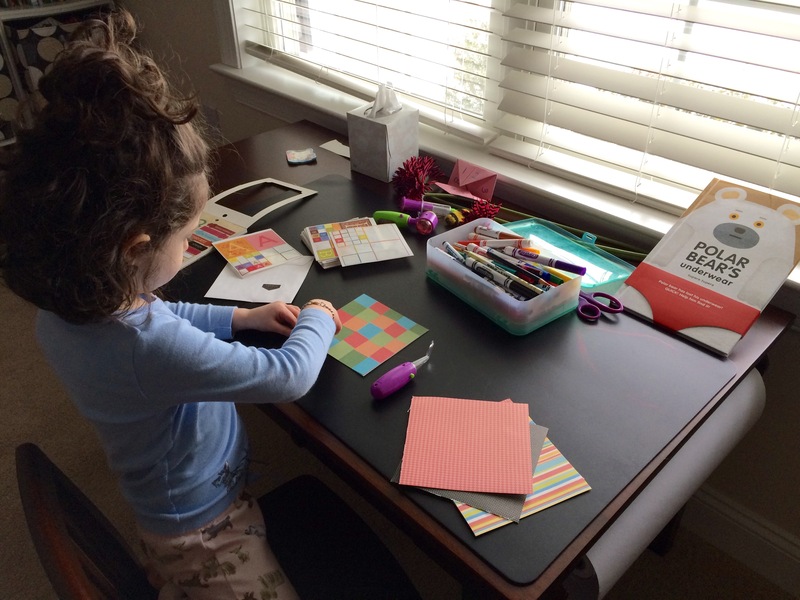 Isabelle went to work in her office (i.e., her playroom) at her desk (i.e., her craft table) too. But five minutes into her office work, she called for me. “Yes?” I walked from my office to her play room. “Why don’t I have a door on my office?” she asked. “I want a door,” she said. I figured I should take it and not be a nit-picker for perfect speech. So I headed back to my office. A special thank you to Betsy, Dana, and Julieanne who helped me a tremendous amount today. Also, a big thank you to my husband who took over for me when he came home from work so I could head back to the computer with less guilt. Without the four of these folks, Isabelle would’ve been really mad at me today. 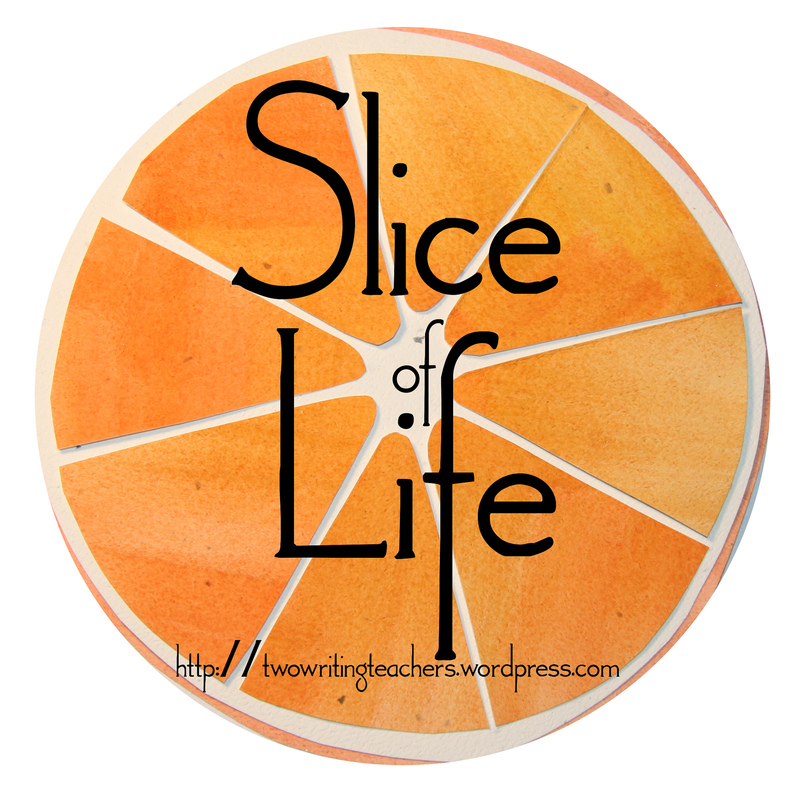 Head over to http://twowritingteachers.wordpress.com on Tuesday for more slices of life.